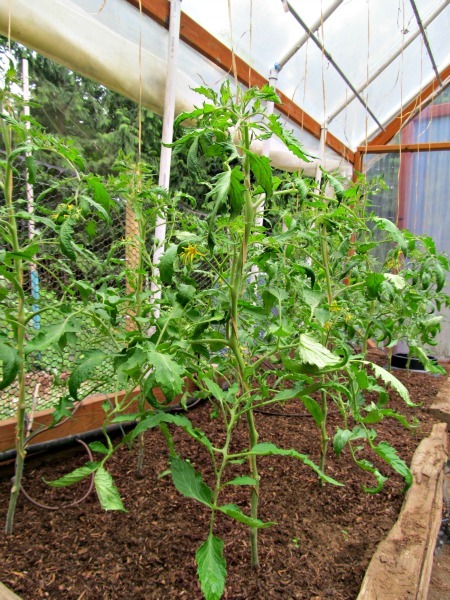 Tomato plant supports help keep plants and fruit off the ground. This is good because when leaves and fruit touch the ground, they are more susceptible to disease, fungus and critters, especially slugs. Determinate San Marzano plant is well-supported by a steel square cage. Tomato plant supports come in all shapes and sizes from a simple bamboo teepee that you build yourself to tomato cages, colorful steel ladders, and expandable coils. They can all do the job as long as they are sturdy and tall enough. The differences between them have more to do with what they will look like in your garden, how much work you will need to do to keep the plant in or on the support and the size of your gardening budget. First check the description of the sauce tomato plants you have chosen to grow to see how tall they will grow. Determinate varieties tend to be bushy and usually no taller than about 5-feet. This type produces most of it's fruit over a 2-week period. Square cages work really well for this type of plant--I like the neat boxy look they make in my garden. It's easy to keep the plants tucked in the cage too, even if I don't check on them very often and I can reach right in and harvest the fruit through the cage. 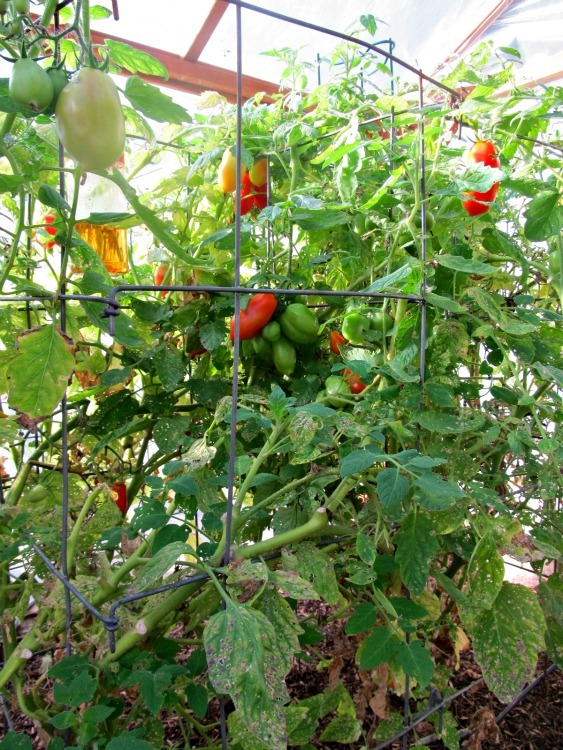 Another option I use are Tomato Ladders from Gardener's Supply Company. If plants get really bushy, you may need to tie them to the ladder with twine. These supports are more narrow than the steel cages and therefore take up less space. They also come in red as well as green. Determinate San Marzano plant supported by a Tomato Ladder. If your tomato variety is indeterminate, you will need a taller, stronger support. Indeterminate tomato varieties are vine-like, can grow to over 8 feet and produce fruit until killed by frost. If grown without support, these plants will sprawl on the ground. The square cages can be stacked and wired together to make a taller support for this type of plant. Or you can use a different method called "tying-up" or "stringing up." 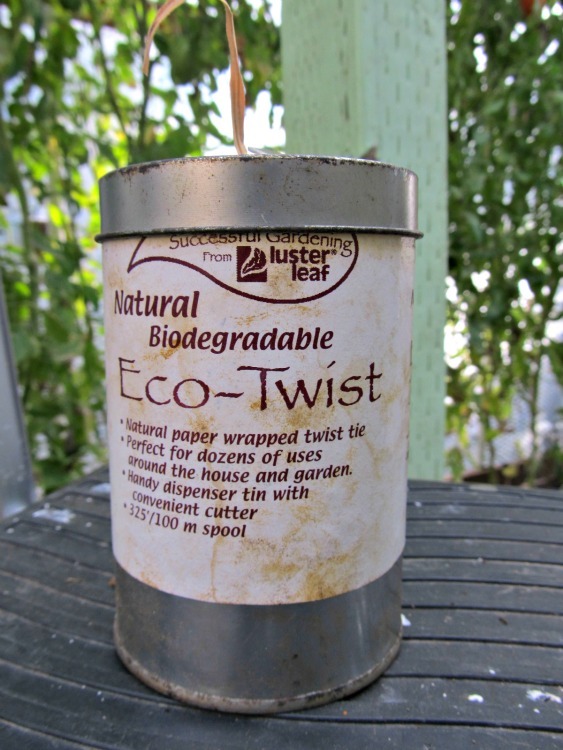 I use a can of biodegradable paper-covered wire with a wire cutter attached to the top of the can but twine would work just as well. I wind a large loop (with room to grow) around the base of the stem and then gently wind it a few times upward around the stem. Then I bring the wire up and over a bar placed high above the plant and lightly twist the excess around the main wire so it will stay put. This is pretty labor intensive because you have to untie and re-spiral regularly as the plants grow and you have to add extra spirals for side shoots, but I think it looks really cool. I learned this technique in The Great Tomato Book by Gary Ibsen, owner of Tomato Fest. 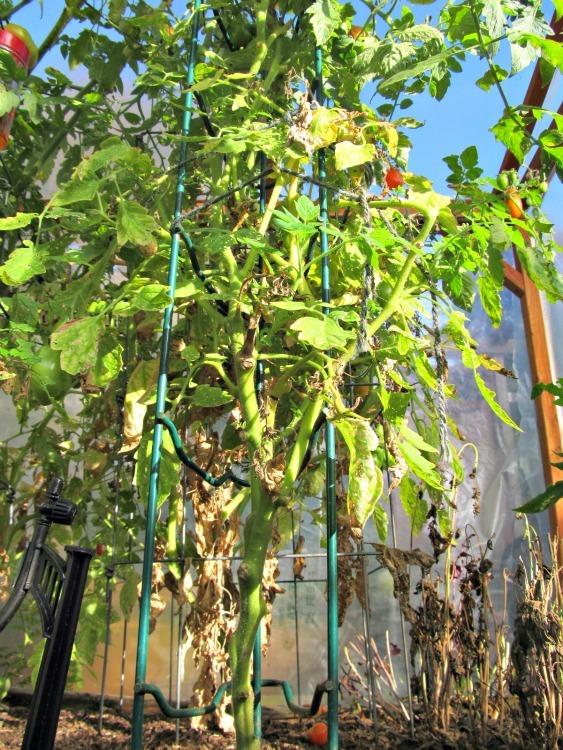 Example of the "stringing-up" method of tomato support. A bamboo teepee is a very simple and attractive DIY way to support your plants, if you have just a few plants that are widely spaced or individual plants in large containers. Use 4 to 6 sturdy bamboo poles in the length needed for determinant (5') or indeterminant (6-8') tomato plants. Place them, evenly spaced, around the plant so they come together at the top. Use twine or the handy connectors shown above to hold them together teepee-style. As plants grow and develop side shoots, tie them gently to the poles. Whatever support system you use, make sure you place it into the soil, around the plant at planting-time. That way the roots won't be disturbed by trying to add it later. As the plant grows, keep it tucked inside or tied to your support.